As I am in the market for a new mobile phone I have been looking at models currently available and due soon. 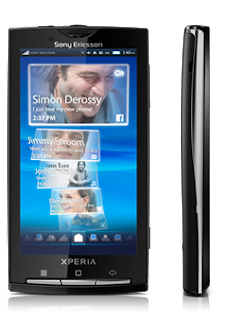 For various reasons I think I would like one which operates on the Google Android operating system and have been using Sony Ericsson phones for a few years so one which is of interest to me is the Sony Ericsson Xperia X10 which is due for release at the end of March. My search for information landed me on the official Sony Ericsson blog and I was intrigued to see this week that they are really getting into the customer involvement area very well - through the blog they are asking for people to try one of the phones and provide feedback to them about how they get on. There is nothing particularly unusual about trials of this sort, but it is interesting to see the selection process so transparently, and the level of involvement which is being expected. I have added my name to the list - if I get selected for the trial I will keep you updated - here's hoping! The blog and the research trial details are here, if you are successful let me know, I won't be at all jealous. Quick update - I wasn't chosen, and I decided to get a Google Nexus One phone insteaad of the Xperia X10, a decision I am very happy with - it is a great phone. Toyota have been in the news a lot over the past week with publicity about the international recall of vehicles potentially affected by sticking accelerator pedals. It has been an interesting issue of managing corporate reputation during a crisis situation so I thought I would share some of my thoughts about it. There have been suggestions that Toyota were slow to react to the situation - it is difficult to know for sure because there is a fairly lengthy procedure for recalls both here in the UK and the US which have to be adhered to before public action is taken. I certainly haven't seen any of the evidence of denial which seemed to be prevalent in the Ford and Firestone tyre recall where each was blaming the other and not taking action. Having started the recall process I think that this week Toyota have been responding very well to the situation, they have been working very hard keeping their customers informed about the situation and advising on what will be happening and when. This is key to managing the potential impact on the brand - they have been open and informative, taking appropriate actions. The PR team at Toyota must have been very busy, I have been following their blogs and twitter feeds from various Toyota sources, seeing how they are doing all the right things to keep the public informed correctly, without being confrontational towards sections of the media who have exaggerated the possible effects on cars. There are different levels of detail available to those who have an interest, the levels being appropriate to the technical knowledge of different groups through to very good, illustrated diagrams of the components concerned. The involvement of Toyota personnel from the very top downwards is good. With the new communications channels available there is a great deal of scope for all sides to make points about issues such as this, but it seems that the overwhelming evidence from more informed sources is that the risk of failure is minimal, and provided drivers are aware of the feel of the cars they are driving and nothing changes there is no need to worry in the short term, but if there are any concerns it can be sorted quickly and easily. People from the President of the AA, through motoring journalists to industry specialists have all come out in defence of Toyota. It may only be time that will tell whether the situation affects the reputation of Toyota, but at present they are doing all the right things to minimise any negative impact, and on the basis that they have a brand built on a very well deserved reputation for quality throughout design, manufacture and usage my own view is that they will be OK, and may well even come out with a stronger reputation. It is often the case that people develop more trust in an organisation that handles a difficult situation well than they would have done without that situation arising in the first place. Through great service at the dealers when people take their cars for the recall work Toyota can build their reputation through customer reassurance. Unfortunately I won't be able to experience this first hand as I don't have a Toyota, but I suspect they will get it right. Overall, it seems to me that Toyota are receiving a lot of media attention which is unwarranted in relation to the numbers of affected cars, particularly if the totals are taken into account. The reaction from Toyota is appropriate - their communication has met the 2S test - swift and sincere so I wish them well.